Learn about zoo animals and how they are different from pets. Learn about Megan Coyle and her animal collages. Compare zoo habitats to habitats in the wild. Make an animal collage and write a story about visiting the zoo. This lesson would work great before or after a field trip to the zoo. Tell students they will learn more about the different animals that live at the zoo. They will study Megan Coyle’s animal collages that were inspired by the zoo. Students will also make their own animal collage and write a story about what they see at the zoo. What animals would they visit? Which animals do they like? Which ones do they like the least? Review the background on the zoo. Discuss the different types of animals that live in the zoo and why we visit them there. Talk about how zoo animals are different than house pets. Read the brief biography of Megan Coyle to familiarize students with the artist. Tell pre-readers about Megan and how most of her animal collages were inspired by trips to the zoo. Have students look at Megan Coyle’s animal collages. Which ones are zoo animals? Which ones are pets? What do her collages have in common? What colors does she use? What types of animals does she collage? What animal would you collage? Print out the story template and have students write a short story or dictate their story to you. Have them imagine that they’re at the zoo. What animals do they see? What are they doing? Review the Make a Collage of your Favorite Animal instructions. Pass out materials for making collages. Tell students to make a collage of their favorite animal and create a habitat for that animal. Have students begin the online lesson activities: Background on the Zoo, Zoo Animal Collages, Animal Habitats in the Wild vs. the Zoo, and read the artist biography. Have the class review the different types of zoo animals and discuss how they are different from household pets. Talk about the animals in Coyle’s collages – do you see certain animals more than others in her work? What colors does she use? What are the animals doing? Talk about how students will make a collage of their favorite animal. Review Megan Coyle’s collage technique. Review different animal habitats. 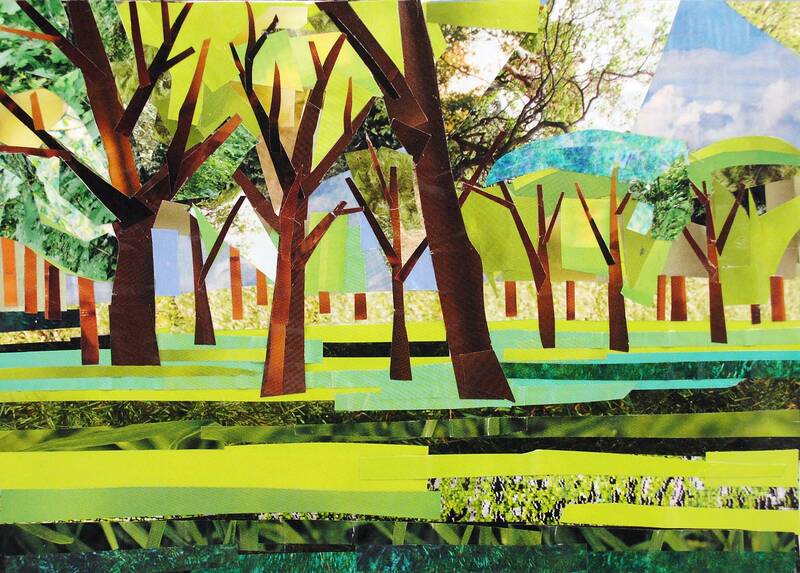 Explain to students that they’ll pick a habitat that they’ll make for their animal collages. Do they want their animals in a natural habitat or man-made one? Print out the Make a Collage of your Favorite Animal instructions and review them with the class. Pass out materials to make collages. Print out the story template. Review the instructions with the class and have students write a story inspired by the zoo. Did the student show a good understanding of the different types of animals at the zoo? Did the student complete an animal collage? Did the student make a habitat for the animal illustration? For the story, did the student use his or her imagination? Did the student mention specific animals and sights found at the zoo?